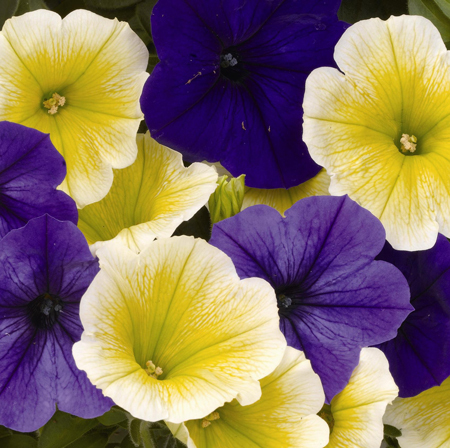 Our Confetti Garden™ ‘Garden Spring’ Combination contains only two petunias, but what petunias they are! Both of the Surprise series, the Marine Blue Petunia emerges the richest, deepest shade of blue, fading to fantastic purple with royal purple venation, while the Surprise Yellow Petunia is a rich golden yellow with spring green venation and throat, all surrounded by a creamy white haloed margin. The larger-than-average blossoms and their vigorous growth will keep you in color all season long. The plants in our 'Garden Spring' plants are grown and shipped in fine quality growing medium and are guaranteed to arrive alive and ready to thrive.